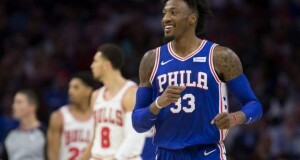 Robert Covington isn’t leaving the Philadelphia 76ers or the city quietly. He recently reached out to the fans to give thanks. The Philadelphia 76ers may be coming to a sports book near you – get the details here. The Philadelphia 76ers appear to have another social media mess on their hands after forward Mike Muscala had to apologize for his father’s comments related to Minnesota guard Jimmy Butler. Former Philadelphia 76ers point guard Maurice Cheeks has been inducted into the Naismith Memorial Basketball Hall of Fame.